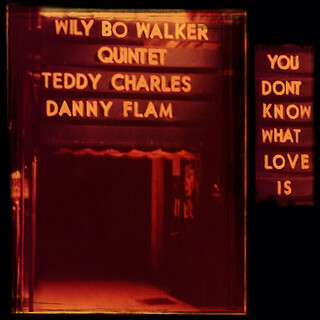 A lot of work went into the melancholy cover art for the Wily Bo Walker Quintet's "You Don't Know What Love Is" single. How does it look? Most music lovers probably know this standard via Billie Holiday's 1958 rendition, but the song was actually written in November, 1941 by Don Raye (1909– 1985) with lyrics by Gene De Paul (1919-1988) for the Abbott and Costello film Keep 'Em Flying. I know right?! Abbott and Costello?! The bombing of Pearl Harbor (December 7, 1941 kids!) occurred in between the film's start and completion, and I wonder if the attack set the stage to 'wake up' the film's editors to the absurdity of featuring this raw passionate song in a slapstick comedy film. “You Don’t Know What Love Is” was left on the cutting room floor just before Keep 'Em Flying's release. At the time the actress and singer Carol Bruce was naturally disappointed. Here's a wonderful Carol Bruce (1917-2007) YouTube clip of her singing style. Look closely -you might recognize her from later work on the sitcom WKRP In Cincinnati. I read somewhere that of all the De Paul and Raye songs and instrumentals, "You Don't Know What Love Is" remains their most appreciated and most recorded.